Consume More Water Drink a 16 ounce glass of water 30 minutes before each meal and a glass with snacks and watch your overall health improve. Everyone knows they should do this but most don’t so there’s a big disconnect. Purchase a large hydroflask, make this commitment, and you’ll be shocked at how much better you will feel. Consume Probiotics Daily Increase the health of your gut by increasing your intake of probiotics including Live Yogurt and food with high fiber such as fruits, vegetables and a cup of legumes/beans daily. Cut Out Processed Junk Food This can be a hard one for most people but if you can remove products such as fast food, chips, candy bars, and pastries, you can quickly start to feel better. A good rule of thumb is to purchase the majority of your groceries on the edges of your grocery store and minimize your purchases in the aisles. Go for fresh! Consume a Handful of Unsalted Nuts Daily which can provide nutrients, healthy fats and aid with weight loss. Remember not to overdo it. One handful is all you need! Don’t Drink Sugar! Sugary drinks like soda pop and high calorie coffee drinks cause you to consume an excess amount of calories with absolutely no nutrient value. People can lose a significant amount of weight just by avoiding pop and their daily Frappuccino. On that note, however, straight Coffee is okay and contains antioxidants and numerous health benefits so you don’t need to forego completely. You just need to be smart about it and go for a straight coffee with minimal additives! Move Your Body Daily! You should never ask yourself should you work out today. The answer to that question is almost always yes! You should always try to do something every day to move your body. It doesn’t need to be a challenging workout in the gym everyday but could be as simple as a 30 minute walk after dinner or on your lunch break. Lift Something Heavy! The true fountain of youth is strength training because it slows down the loss of muscle mass and therefore has a very positive impact to metabolism, bone density, posture, endurance and strength. Try for 2-3 times per week. Get 7-8 hours of Good Sleep Every Night. The importance of quality sleep to your health cannot be overstated! Poor sleep habits can increase weight gain and stress and decrease your energy and overall physical and mental performance. Develop a good sleep routine such as reading at night and/or turning off all electronic devices before bedtime. Breathe! Take a minute each morning and/or at bedtime to focus on slow, deep breathing. Just this act of oxygenating your blood can bring forth wonderful health benefits. So which of these 10 can you commit to?! Go for it – you deserve to look and feel your best! 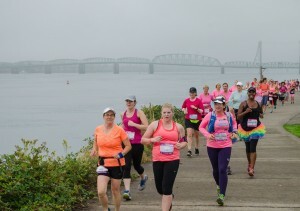 Girlfriends Run for a Cure Half & Quarter Marathon October 15th, 2017 in Vancouver, WA.